In stock -This product will ship today if ordered within the next 9 hours and 20 minutes. Nature`s Answer Passionflower is an alcohol-free, kosher fluid extract which has calming properties, offering 2000mg per serving. 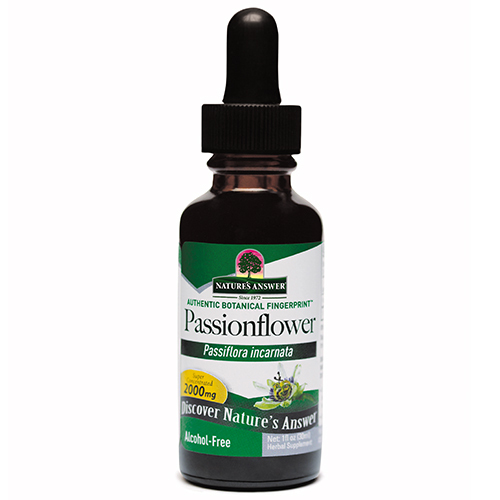 Passion Flower (Passiflora incarnata) Extract. As a dietary supplement take 1-2ml (28 to 56 drops), 3 times a day in a small amount of water. Below are reviews of Nature`s Answer Passionflower - 30ml by bodykind customers. If you have tried this product we'd love to hear what you think so please leave a review. I buy this for my rescue dog. He has anxiety-agression issues but this makes a huge difference. I mix it in his food & even put some rice cakes for him & he sees that as a treat. Highly recommend this & will continue to buy. Just wish there was a multi buy discount on it as with many other products on the site!